Today was a shopping day! A battle in the long weekend traffic and a full days worth of shopping at Yorkdale, our favourite mall! Along with several fashion purchases (a new Longchamp bag, new Levi’s, etc. etc. boring) there were of course many beauty purchases purchased, I just can’t help myself. One of the first shops of the day was The Body Shop. Since I’ve been testing out all my body lotions and attempting to revamp my skin, I decided that I really wanted to try the Body Shop’s Vitamin E Body Butter. It’s time to get serious! With a lovely light and fresh scent with a hint of rose, this body butter will be the perfect moisturizer after every shower! The Body Shop was having a great back to school sale so of course I couldn’t stop there. As I’ve been using the Ionic Seaweed Clay Mask, I’ve decided that I want to try the rest of the line. They were offering small bottles of each: Mattifying Day Cream, Deep Cleansing Facial Wash, Clarifying Toner, and Clarifying Night Treatment all zipped up in a small bag for only $15!! Perfect for travelling!! Couldn’t pass that up! So excited to give them a try and let you know what I think! When it came to Shoppers I really only needed a new mascara, and with the help of a coupon I went with Covergirl Clump Crusher. Yet of course I would never leave with only one purchase. Other than a few magazines: Allure and Glow, and a few more EOS Lip Balms (review to come soon), the purchase that I’m very excited for is the St. Ives Fresh Skin Apricot Scrub. I love using exfoliating scrubs on my skin once or twice a week, but after running out of my St. Ives Purify Exfoliating Body Wash with kelp and sea salt I’ve gone a few weeks without one. I love St. Ives exfoliators and I’ve heard a lot about the Apricot Scrub so I’m super excited to give it a try! I’ll let you know how this one goes. My entire purchase was 20% off due to another coupon! 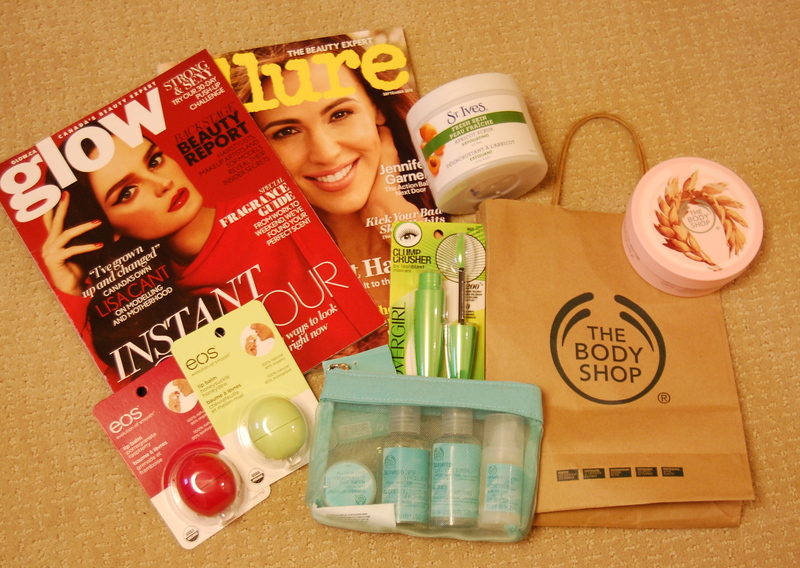 Not a huge shopping trip, but some great products that are worth sharing and talking about, bought with some great coupons courtesy of Shopper’s Drug Mart Optimum card holders benefits (SEE THE BENEFITS?!). So get shopping lovelies!!! And let me know how it goes.